This month Jackpot Capital Casino is known for its massive casino bonus giveaways and this month they're giving away another $1000 bonuses during the "Fantastic Bonuses" bonus promotion. Wandering through a mysterious forest and collect fantastic bonus mushrooms. 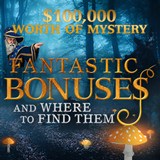 There's $100,000 in casino cash is hidden in the dark and eerie woods! Every Monday until December 4th, Jackpot Capital will give $20,000 in casino bonuses to frequent players and another $5000 will be randomly awarded every Friday. Jackpot Capital players earn points when they play any of the games from Realtime Gaming in its online casino or mobile casino. They get weekly bonuses based on their points ranking. Frequent players get weekly bonuses up to $600; random draws give everyone a chance to win.